'Tact' (Keith Keppel, R. 1994). Seedling #90-6K. IB, Height 24" (61 cm), Early to midseason bloom. 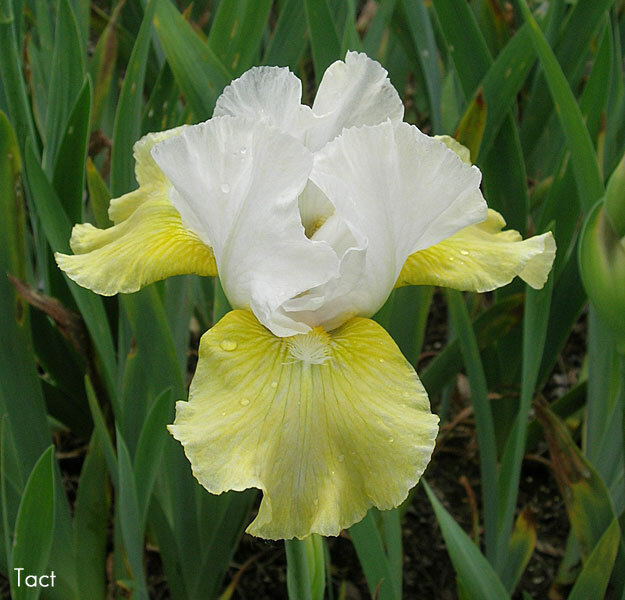 Standards warm white (M&P 9-AB-1); style arms white; falls aureolin yellow (10-L-2); beards white at end, sunflower (9-L-4) and golden glow (9-L-6) in throat; slight fragrance. 'Over Easy' X 'Amber Snow'. Honorable Mention 1997. Keppel 1995. Fertile both ways. From AIS Bulletin #296 January 1995 Introducing TACT (Keppel) IB, EM 24" (Over Easy X Amber Snow). Lightly ruffled white and aureolin yellow amoena. #90-6K. $15.00. Keith Keppel.